Hello everyone, I must apologize for discontinuing my 30 day challenge. I realized that the challenge was asking me to share a lot of useless information. I know its ironic that as a blogger, I'm saying I wasn't comfortable sharing information. However, I started blogging to talk about God, and to share my walk with God. As much as I would love to share my pet peeves and comfort foods with the world, this blog is not the avenue. Here, I will share things about myself that are related to my relationship with God, and not some random and probably boring information. Before you read on, please take a moment to pray for the repose of the souls of those who were killed in South Carolina. But can we think about this- what better way to die is there, than to be shot dead right in the house of your Heavenly Father. But that's not the point. The point is that this world is filled with hatred and evil. It beats me that someone can hate another squarely for the color of their skin. Jesus have mercy! That said, today I am sharing a video with you, and here is a little preamble to the video. If there are two things I want to be in life, they are holy and prayerful. 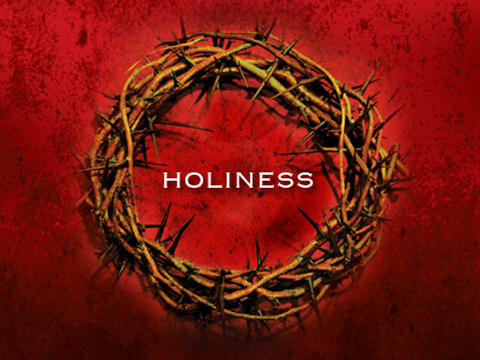 I want to be holy as God is holy- that is a command for all Christians. That command is given over three times in the bible. God is not a talkative, if He says something once, and His servants hear it twice, surely, something mentioned three times in the bible is to be taken with utmost seriousness. Secondly, I want to be prayerful, because the Bible says we are to pray without ceasing. Take away my education, my family, and all forms of ambition if that would give me the two desires I mentioned. Today, I'm sharing a bible study video by Pastor Adeboye where he teaches about sanctification. From the name of my blog, you can probably tell that I am obsessed with holiness and sanctification. Although I am such a work in progress, I do aspire to hear God call me a good and faithful servant! There was a period of my life where I was living in sin and deceiving myself that I was worshipping God and that His spirit was manifesting in me. I would speak in tongues, fall under the anointing of God, pray with and for my friends, fast, pray some more, and then walk right back into my life of filth. But God fought for me. He really fought for me, and He is opening my eyes to see where I was and giving me a glimpse of where He is leading me. I am indebted to God that He did not give up on me. I know where I have been, it may not have been the worst of places to be, but God is a God of absolutes- He forgives and loves completely. He also gives exceedingly abundantly above all we can ever ask or imagine. So, when He asks us to be holy and perfect, he means just that- we should be holy and perfect. No ifs, buts, and maybes. We often excuse our sins by saying that it is impossible to be perfect and holy because we are human beings. I do not accept that argument. Because Job. Yep, that's God, the maker of the universe, boasting about a human being, a human being like you and I. It's possible to be like Job. God forgives us and promises to remember our sins no more, if only we would come to Him. We must repent and accept Jesus as our personal Lord and savior. That is the best decision anyone could ever make in their life. Side note- If there are only two people I want to meet soon, they are Pastor Adeboye and Goodluck Jonathan. Please, try not to question my choices. Haha. I know that I am catholic, and Pastor Adeboye is a pentecostal preacher. I also know that Goodluck Jonathan has been called all sorts of names, and riddled with several heinous charges. But I still want to meet both of them, and I will tell you my reasons after my meetings. With that in mind, ladies and gentlemen, please take some time to watch this bible study and gain some everlasting nuggets of wisdom! You can start watching from about 10 minutes in. Image from here. Videos from youtube. Forgiveness seems Lazy; am I really expected to forgive Dylan Roof?